Last night parts of America went to vote on various candidates for primaries and special elections. 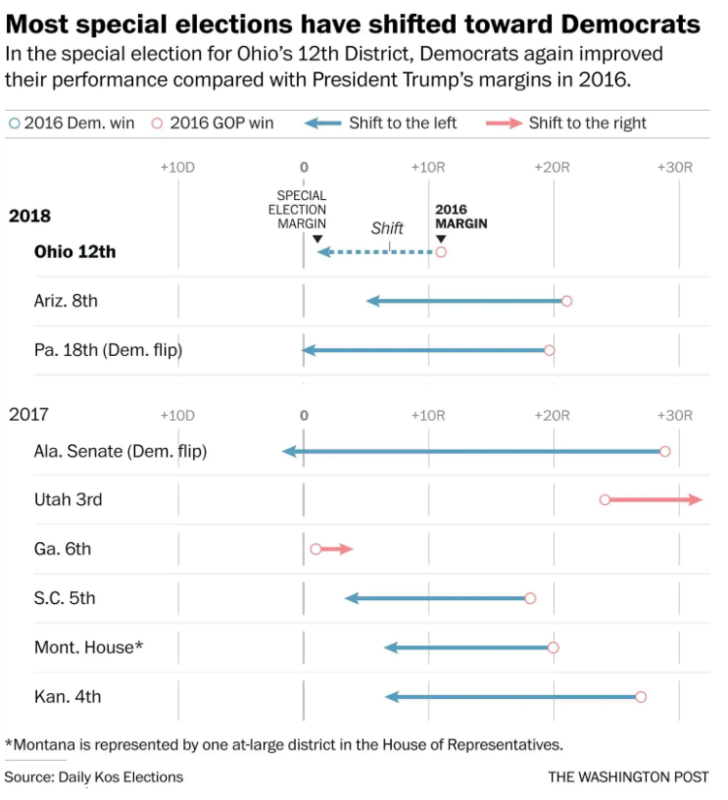 The most-watched and silliest race was the 12th District of Ohio. It was most-watched because it is regarded as a bellwether of the upcoming November elections (more on that later). It was the silliest because it was a special election to fill a vacant seat — a seat that is only available for three months, and then the “incumbent” has to face another election. Ohio’s 12th Congressional District in the northern Columbus suburbs wasn’t supposed to be competitive for Democrats. Trump won it by 11 points. He campaigned for the Republican candidate. AND the district was gerrymandered to give the Republican candidate an advantage. And yet the Democratic candidate, Danny O’Connor, still has Republicans biting their nails in this special election. With thousands of provisional ballots left to be counted, Balderson — the Republican — is ahead, but O’Connor has not conceded. Voter fraud hunter and Kansas Secretary of State Kris Kobach is in a dead heat with incumbent Gov. Jeff Colyer in the Kansas Republican primary for governor. The Washington Post reports that with 94.8 percent of the precincts reporting, at 6 a.m. Colyer has 120,662 votes to Kobach’s 121,203. All this bodes badly for Republicans in November. But to understand the change, we need to look at Ohio 12th. What changed? Turnout. Specifically, there was a turnout gap between the most and least heavily populated parts of a district that absorbs the close-in suburbs of Columbus and rural stretches of central Ohio. On the other hand, the far left did not do well last night. In Michigan’s Democratic gubernatorial primary, Senate Majority Leader Gretchen Whitmer defeated Detroit health official Abdul El-Sayed. The support of Sen. Bernie Sanders (I-Vt.) and Alexandria Ocasio-Cortez, the New York congressional candidate, was not enough for El-Sayed to overpower the establishment Democrat. Maybe it is all too much. Baby steps. Let’s just hope they don’t act as spoilers.